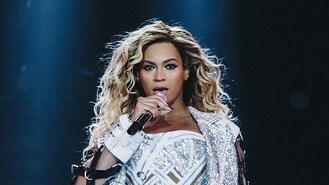 Beyonce has given one of her fans a memorable birthday by taking a break in a concert to sing happy birthday to her. Shehnaz Khan was celebrating her 22nd birthday at Beyonce's Birmingham gig when the Drunk In Love star stopped to take her hand after spotting her birthday badge. According to the Birmingham Mail, Shehnaz and five friends were upgraded to the VIP area after being spotted by Beyonce's management and the shocked fan didn't even realise she was still recording the moment as her idol held her hand. In Shehnaz's video, Beyonce can be seen saying: "You got the sign and everything, What's your name and how do you spell it?" Shehnaz said: "Incredible, when is that ever going to happen again?... I was wearing a birthday badge which she noticed early on in the show, she kind of nodded in acknowledgement. "I've been to quite a few of her gigs. But I can't believe she stopped the show for me. I really wanted her to sing to me but I can't believe she did it. "I was leaning over the barrier holding her hand and not realising the camera in my other hand was recording. Everyone around me was going crazy." Oasis are to release their original demo tape, which they created to drum up interest in the group, as part of the celebrations for the 20th anniversary of their debut album. Coldplay have surprised fans by unveiling new material with little fanfare by posting the video online. The Wanted's Nathan Sykes has revealed that his life has changed since undergoing throat surgery. Pharrell Williams and Calvin Harris will perform at this year's T in the Park music festival. Nile Rodgers is set to close the 2014 Bestival with Chic. Damon Albarn has hinted that his Blur band-mates are "too busy" with other commitments to focus on the group. Justin Bieber has become the youngest-ever artist to reach one billion views on Vevo, after his hit, Baby, officially passed the milestone mark.